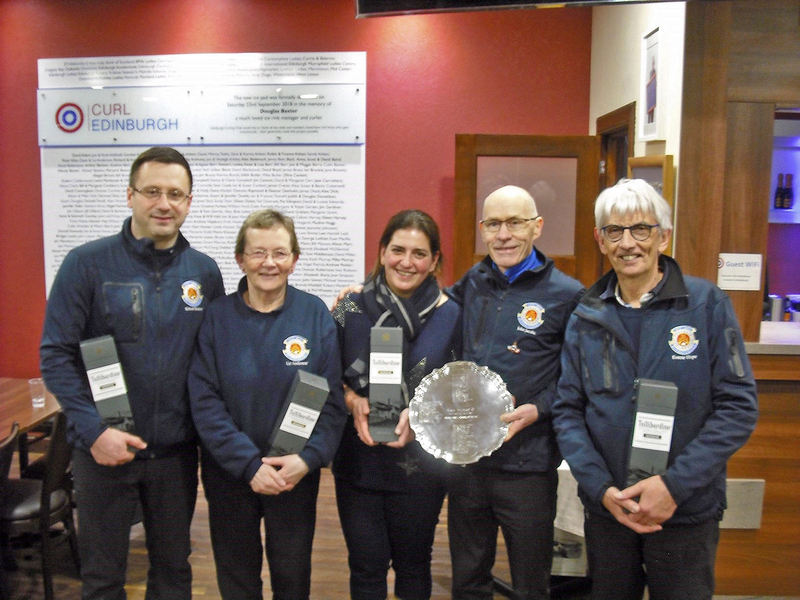 Midlothian met Dundee & District Province on Sunday afternoon (24 Feb) at Murrayfield in the Waldie Griffith. The four rinks representing Midlothian were Carrington, Clydesdale Bank, Midcalder, and Penicuik. Penicuik skipped by Andrew Lambie, with Dave Anderson, Jim Ramsay, and Ken Hunter, was drawn against Dundee University. Penicuik took first blood with a four in the opening end. A slightly heavy final draw in the second end from our opposition caught a front stone and deflected to just beat three Penicuik counters. Penicuik took a single in the third end, and followed it up with another four in the fourth end. Dundee came back in the latter stages of the game to reduce their deficit from 8 shots to 3 shots (final score 9-6). Overall Midlothian ran out winners by 50 shots to 16 shots, an average of +8.5 shots up. It remains to be seen if this will be sufficient for MIdlothian to retain the trophy won in 2017-18. This entry was posted in Competition, External on February 26, 2019 by captainken45. Penicuik will play RBS in the ﬁnal of the King George IV Trophy Competition on Friday 1 March, following a great semi-ﬁnal win the week previous against Sweepers C.C. 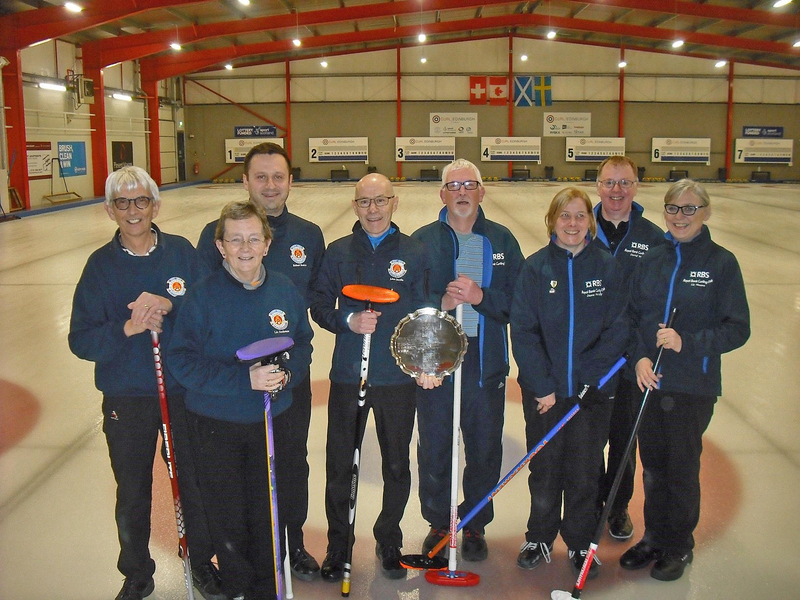 For the ﬁrst time in the competition, the Penicuik rink remained unchanged and was the one that knocked out DAFS in the quarter-ﬁnal: John Jacobs (skip), Robert Beaton (third), Ronnie Hope (second), and Liz Anderson (lead). Penicuik got out of the blocks quickly, taking a two then a three, to be 5-0 up after two ends. As in all previous rounds, Liz at lead put the opposition lead under pressure from the start, playing with pinpoint accuracy to set up the head, and forcing her opponent into making tricky shots and slight, but signiﬁcant errors. Ronnie and Robert built on this foundation with some steady shots into the front of the house which gave John the opportunity to raise or guard and rack up the points. 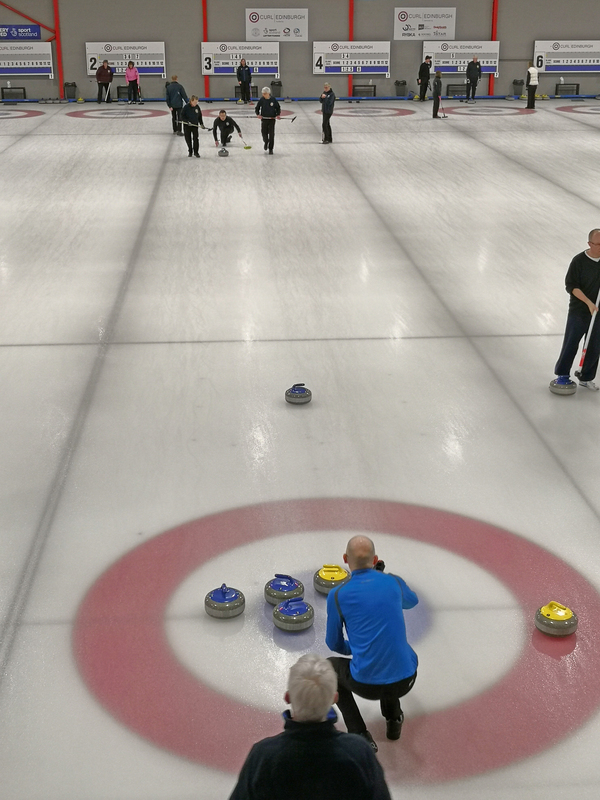 Sweepers clawed back with a two at the third end, but Penicuik played their best curling at the fourth, and following a full team effort notched up a ﬁve. 10-2 after ﬁve ends! The sixth could have been dangerous, with a single Penicuik stone lying shot but vulnerable to a tap-back, and with a clutch of Sweepers’ stones lying invitingly at the front of the house. However, John played a magniﬁcent draw through a narrow port to cuddle up to the Penicuik stone and remove the tap-back danger. The Sweepers skip was short with his last stone raise and Penicuik stole another point. 11-2 after ﬁve ends and the Sweepers skip called a halt to proceedings. The Sweepers rink were magnanimous in defeat and following a particularly friendly drink in the bar wished us well in the ﬁnal. RBS have had solid wins over Bruntsﬁeld, SIAE and Edinburgh Rotary to reach the ﬁnal, but Penicuik’s record is equally impressive against Stewart’s Melville, Holyrood, DAFS and Sweepers. Should be a good game! This entry was posted in Competition, External on February 25, 2019 by captainken45. Penicuik met Midcalder in the first round of the competition on Sunday afternoon (9 Dec). The Penicuik team was skipped by Andrew Lambie, with Dave Anderson, Jim Ramsay, and Ken Hunter at Lead (an eleventh hour Sub for an unwell Dave Carr). Midcalder applied considerable pressure in the opening two ends and only well judged final shots by our Skip held them to singles. Penicuik rallied in the third end to take a two, then Midcalder worked a single in the four end to go 3-2 up. Penicuik tied the game with a single at the fifth, and went on to steal a two at the sixth, followed by a single at the seventh to end up winners 6-3. A good game for us, played in the appropriate spirit by both sides. Penicuik will meet Corstorphine in the next round on Sunday 6 January (12.00pm). This entry was posted in Competition, External on December 10, 2018 by captainken45. In the second round of the King George, Penicuik beat a Holyrood rink, Due to conflicting fixtures, Keith Morris took over as Skip and Craig Brown came in to play at Second. This entry was posted in Competition, External on December 4, 2018 by captainken45.